Gephyrophobia is the fear of bridges. Some of us either suffer from this anxiety disorder or know someone who does. Typically, those with gephyrophobia clench up, close their eyes, and sweat profusely as they move across one of the world’s many bridges. Praying is a common occurrence, as well. While gephyrophobia is irrational, bridges have collapsed in the past. Furthermore, in the dark world of urban legends and folklore, bridges are often depicted as seats of mystery, evil, or both. The following 10 bridges serve as the backdrops for numerous ghost stories, all of which are guaranteed to frighten gephyrophobes and non-gephyrophobes alike. Located near the cities of Denton and Copper Canyon, Texas, the Old Alton Bridge was originally built by the King Iron Bridge Manufacturing Company as a way to transport people and cattle. Its name comes from Alton, an abandoned town in Denton County. The bridge remained in use until 2001, when it was closed to vehicle traffic. Although listed on the National Register of Historical Places, the Old Alton Bridge is better known today as the Goatman’s Bridge. According to legend, a successful goat breeder named Oscar Washburn began to call himself the Goatman. Apparently, in order to drum up business, Washburn hung a sign on the bridge reading: “This Way to the Goatman.” The local KKK was not at all pleased. In August 1938, masked Klansmen abducted Washburn and hung him from the bridge. However, when the murderers looked down to make sure that Washburn was dead, they could not see his body at all. Angered by this, the Klan members returned to Washburn’s home and killed his entire family. Since then, people interested in ghost stories have reported seeing abandoned cars near the bridge, mysterious lights, and even the ghostly figure of a goat herder leading his flock across the bridge. A common legend trip before 2001 involved people driving across the bridge with their lights off. This action supposedly caused the Goatman to appear. Another variation claims that if you honk your horn twice on Halloween, the Goatman’s eyes will materialize. The story of the infamous Hell’s Bridge in Algoma Township, Michigan, revolves around the fictional figure of Elias Friske. Back in the mid-19th century, several towns in Kent County experienced a wave of child abductions. One of the hardest hit was Laphamville (today’s Rockford). In order to combat the menace, townspeople called upon the elderly and seemingly kindhearted Friske, who surprised many by preaching a fire and brimstone gospel that blamed demons for the recent disappearances of so many children. Despite Friske’s strange preaching, the townspeople trusted him to watch their remaining children as they searched the woods for the bodies of the missing kids. This was a major mistake, for Friske, who was driven to madness by the pungent stench of the dead and skinned children whom he had previously murdered, killed the town’s remaining children one by one and threw their bodies into the River Rouge. Upon returning from their failed search, the townspeople discovered the newly murdered bodies of their children underneath a new bridge that spanned the river. After capturing Friske, who blamed his actions on demons, the townspeople lynched the old man by hanging him from the bridge itself. According to the legend, Friske’s body was quickly snapped up by the river below. In truth, Hell’s Bridge is nothing more than a narrow metal walkway that crosses a tributary of the River Rouge, not the river itself. This has not stopped the many stories from expanding, however. Most simply claim that the bridge is supernaturally active, with inexplicable vapor and orbs predominating among collected evidence. One captured image proclaims that a floating noose can be seen. Near Loop 1604 in San Antonio, Texas, there sits a small bridge that crosses Elm Creek. To most observers, this bridge is the definition of ordinary; there’s nothing demonstrably unique about it. 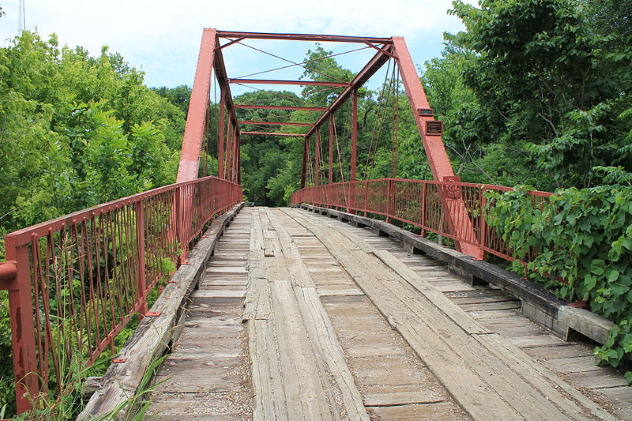 In truth, this is the “Donkey Lady Bridge.” According to Texas folklore, during the mid-19th century, a Texas settler family lived near what would become the bustling metropolis of San Antonio. One day, the son of a wealthy merchant ran afoul of the family’s donkey (or horse) and began to savagely beat it. Realizing that their livelihood was at stake, the pioneer family hurled rocks at the wealthy young man. Incensed, the merchant’s son vowed revenge. Sometime during the following night, the young man returned to the farm, except this time he had an armed posse with him. The thugs set fire to the family’s home and didn’t allow any of the other settlers to interfere. When the husband tried to escape, he was shot dead. As for his wife, most of her body was thoroughly burned, but she managed to escape to nearby Elm Creek, where she disappeared forever. Since that tragic day, the bridge over Elm Creek has become a popular destination for legend trippers. In particular, it is believed that if you park in the middle of the bridge at night and turn your lights off, the Donkey Lady will appear. Most accounts of this ghost depict her as a hideous human-animal hybrid with loose, baggy skin. 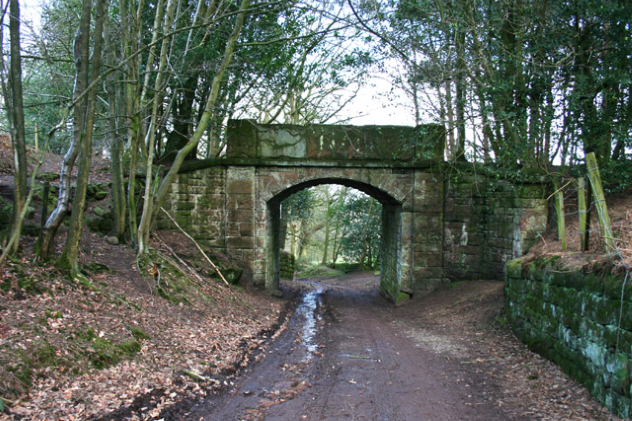 Built sometime in the 1850s, the so-called “Haunted Bridge” on Peckforton’s Hill Lane is little more than small footbridge that allows travelers to reach Peckforton Castle. Like many castles in England, Peckforton Castle is reputably haunted. The castle is undeniably strange, for in 1859, stonemason John Watson was commissioned to create a 3.7-meter-tall (12 ft) stone elephant that was intended to act as a beehive. Today, the outlandish stature is a tourist attraction. The weirdness of the castle itself pales in comparison to the Haunted Bridge. One of the more common stories about the bridge claims that if you walk under it and keep your eyes focused straight ahead, the ghost of one of the castle’s former servant women will appear. Other stories claim that instead of seeing the ghostly servant, visitors will hear her walking on the bridge above them. An even more disturbing belief is that anyone who sees the woman’s ghost will be dead within the year. In Greenville County, on Route 107 and just off of Highway 11, sits the Poinsett Bridge, supposedly one of the most haunted structures in all of South Carolina. 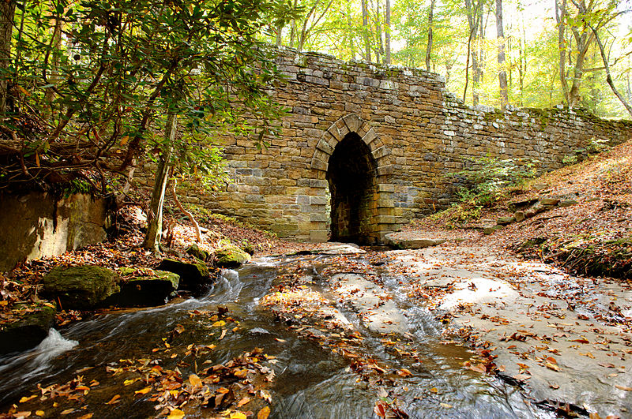 Made entirely of stone, the Poinsett Bridge is believed to be haunted by the ghost of a young man who died in a car accident during the 1950s. Another popular story claims that the spirit of a slave who was lynched haunts Poinsett Bridge. The fact that the Poinsett Bridge is one of the oldest bridges in the entire Southern US makes such rumored history all the more plausible. 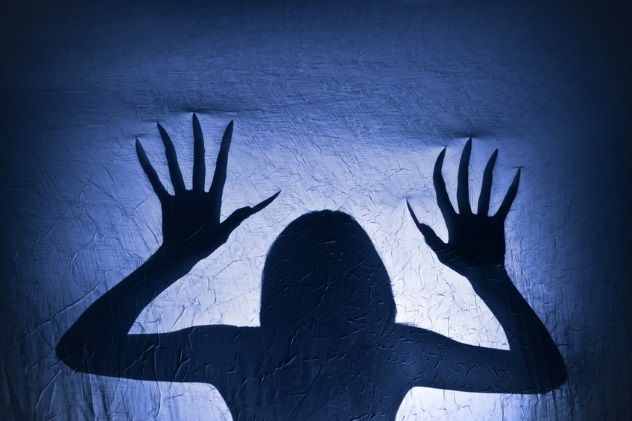 In every state in the US, there are so-called “crybaby bridges.” Earning their titles from reported accounts of hearing strange baby cries during the night, these structures are supposedly haunted by the ghosts of dead (sometimes murdered) children. In Salem, Ohio, a crybaby bridge can be found just off of Egypt Road. Currently closed and defended by a single, rusty bar, the Egypt Road Bridge forces ghost hunters to decamp from their cars and walk across its spooky surface. As with most urban legends, there are multiple stories about why the dilapidated bridge is haunted. In one tale, a young couple was too busy arguing to notice that their toddler had fallen off of the bridge. In another version, a mother jumped off of the bridge in order to rescue her baby, but both wound up drowning. When their bodies washed ashore, the grief-stricken father ran off into the woods and was never seen again. If the legends are true, then Egypt Road Bridge is somewhat unique in that paranormal activities are said to happen during the day and night. Although researchers have only been able to date the various stories about the bridge to 2005, the bridge does have a connection to a truly horrendous event. In 2010, the badly burned body of 60-year-old Ardes Bauman was found inside of a van parked near the bridge. Officially declared a homicide, the case remains open. Traversing Hinkston Creek in Bourbon County, Kentucky, the Colville Covered Bridge is a beautiful structure that was originally built in 1877 by Jacob Bower. After several decades of reconstruction, including a thorough dismantling in 1997, the bridge was reopened to traffic in 2001. 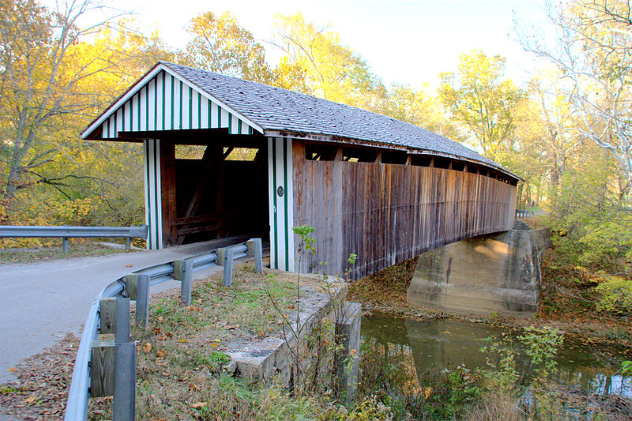 Since then, the bridge has become one of the Bluegrass State’s better-known haunted locations. The many ghost stories about the Colville Covered Bridge tend to conform to the many tropes attached to haunted bridges. Supposedly, during the 1930s, while two teenagers while on their way home from the prom, they lost control of their car and died after plunging into the creek below. Not long after, residents began to see ghostly lights underneath the bridge. Another story claims that an elderly woman named Sarah Mitchell died while crossing the bridge on foot. Her ghost, along with the ghosts of the two teenagers, is the reason why many modern Kentucky visitors journey to the bridge at night and watch for ghostly vapors or floating orbs. The Seven Gates of (or to) Hell Bridge in Collinsville, Illinois, shares its name with several other locations in the United States. In York, Pennsylvania, many believe that a portal to Hell exists in a patch of woods near Hallam (or Hellam). Athol, Massachusetts has its own Seven Gates of Hell; this time, the area in question is a clearing not far from Pleasant Hill Road. It’s believe that Athol got its own portal to Hell thanks to an altar that was used to perform human sacrifices. As for Illinois, the Seven Gates of Hell is a multistep legend. Essentially, if one goes through each “gate” in order at midnight, then upon entering the seventh, the doors to Hell will be thrown open, and the brave individual will be pursued by hellhounds. In Collinsville, the gates are as follows: Travel east on Lebanon Road until you reach Arnotti Lane (1), take a left on Lockman Road(2), take a right onto Longhi Road(3 and 4), take Lockman Road until you reach Lebanon Road, and then continue on until you can make a left on South Liberty Road(5), take a right on West Mill Creek Road(6), and follow West Mill Creek Road to Blackjack Road, take a left, then take a right after reaching Bauer Road (7). According to the various stories associated with the Seven Gates of Hell, the area is haunted by everything from the ghost of a murdered African American boy who was lynched by the KKK to the more sinister spirits of the devil worshipers who used to frequent the area. 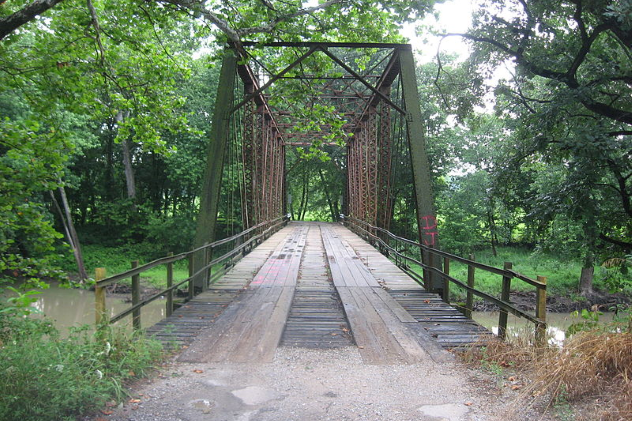 While most haunted bridges base their tales on rumor and secondhand storytelling, Airtight Bridge in Ashmore, Illinois, has a very real and very bloody origin for its many ghost stories. 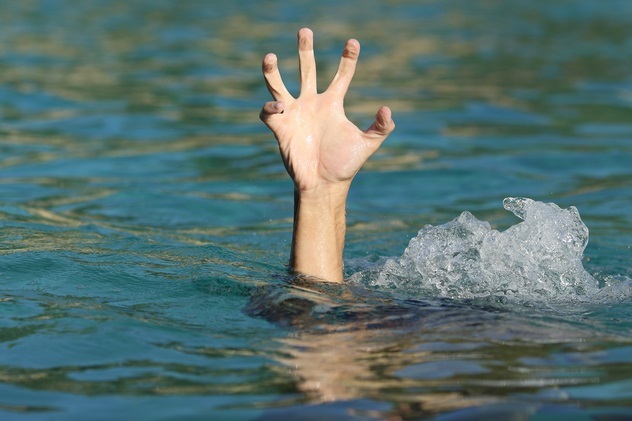 Back in 1980, the Coles County Sheriff’s Department discovered the dead body of an unidentified young woman floating in the Embarras River underneath the Airtight Bridge. Based on the fact that DNA testing was rudimentary in the 1980, plus the fact that the killer had removed the woman’s hands, police were unable to identify the murder victim for over a decade. Finally, in 1992, the victim was named as 26-year-old Diana Marie Riordan-Small, a native of Bradley, Illinois. Despite this major development, the case remains cold. Many people who visit the bridge today report an uneasy sense of stillness (hence “Airtight”) that lingers around the entire area. Others claim that the person responsible for Riordan-Small’s murder occasionally returns to the bridge in order to relive his terrible deed. Although teenagers have been known to use the bridge as a hard-to-find place for late-night parties, others avoid the bridge because so many believe it to be haunted. 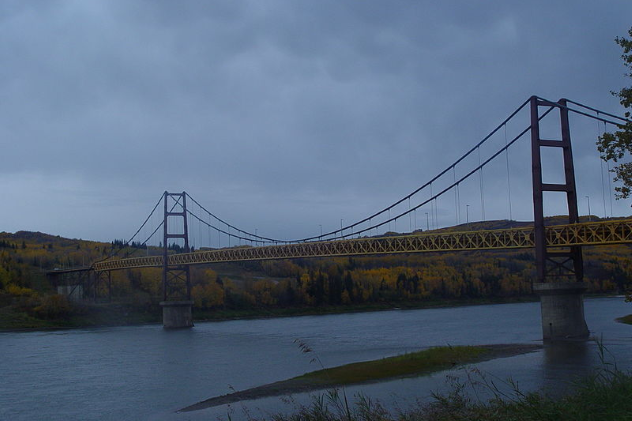 Located in the unincorporated community of Dunvegan, Alberta, Canada, Dunvegan Bridge is a relatively new structure. Completed in 1960, the bridge is one the largest suspension bridges in all of Canada. It may also be the country’s most haunted. According to folklore, in November 1960, two men were caught driving in one of western Canada’s many nasty snowstorms. When they came to the newly built bridge, they had to stop halfway. This was not due to the weather, but rather to the appearance of a strange woman in white. Partially hidden by the snow, the woman apparently wore a white cloak with a hood. She was also barefoot. After offering her a lift, the men realized that the woman did not or would not notice them. They continued on, but they couldn’t forget what they had seen. Over several nights, the men returned to the bridge with friends in order to locate the woman. When they finally saw her picking berries while snow accumulated up to her ankles, they decided that she was a ghost. A slightly different version of this story claims that the spirit of Dunvegan Bridge was once a Roman Catholic nun. Neither version of the story provides much in the way of details, however.